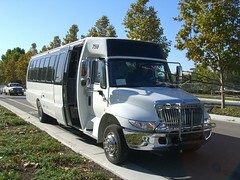 It is my second ride with Yahoo commute shuttle provided in Fremont. The parking in ACE park & ride in Mission Blvd across from McDonald is so much better as there are plenty of parkings late in the morning. My first ride with YEB (yahoo east bay) shuttle was in the Fremont bart station and I ended up having a sticker in my windshield with parking violation warning --- shame. I was sprinting to catch the shuttle and I was not thinking twice when I parked my car in the Naz cinema next to the bart station. I parked illegally after failing to find a spot in 10 minutes circling the parking lot. Free commute shuttle, I love Yahoo!!!!! My commute will never be the same.